Sarah Louisa Hinshaw1,2,3 [Sally Hinshaw2,3,4, Sallie Hinshaw5,6,7,8]. 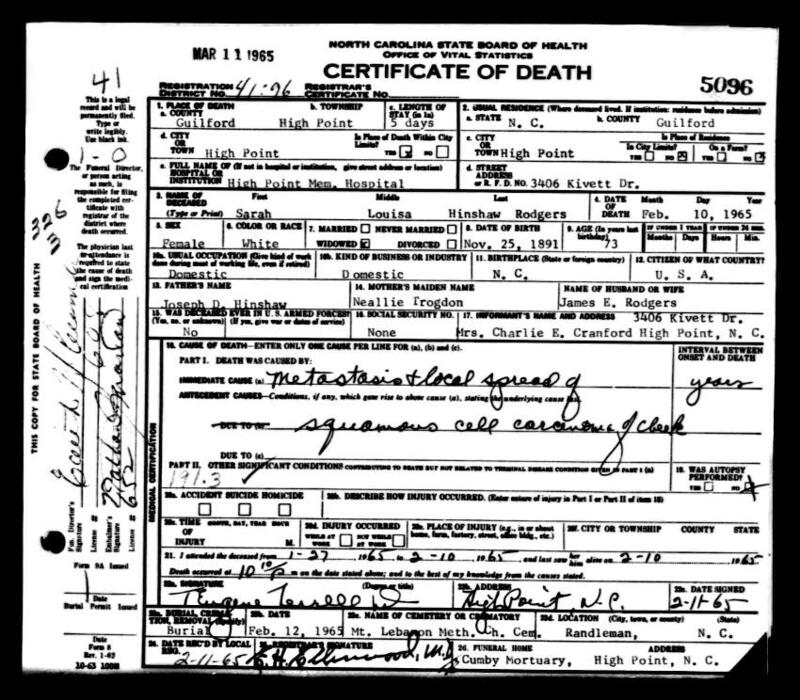 Born Nov 25 18911,4,7,8 [Oct - 18916], North Carolina1,4,7,8. Earl Wallas "Ivey" Rodgers, born Aug 19 1914. Edith Rodgers, born Sep 26 1916. Rogers, J. Edward, head-of-household, age 29, born in North Carolina; parents born in North Carolina; owned home; occupation: electrician. Rogers, Sallie, wife, age 28, born in North Carolina; parents born in North Carolina. Rogers, Ivey, son, age 6, born in North Carolina; parents born in North Carolina; attended school. Rogers, Edith, daughter, age 3, born in North Carolina; parents born in North Carolina. Rogers, Dorothy, daughter, age 4 months, born in North Carolina; parents born in North Carolina. Rogers, Donald, son, age 4 months, born in North Carolina; parents born in North Carolina. Rodgers, Edward, head-of-household, age 39, born in North Carolina; parents born in North Carolina; first married at age 22; rented home ($15 rent); no radio in home; occupation: electrician, public service; not a war veteran. Rodgers, Sally, wife, age 38, born in North Carolina; parents born in North Carolina; first married at age 21. Rodgers, Ivey, son, age 16, born in North Carolina; parents born in North Carolina; attended school. Rodgers, Edith, daughter, age 13, born in North Carolina; parents born in North Carolina; attended school. Rodgers, Dorothy, daughter, age 9, born in North Carolina; parents born in North Carolina; attended school. Rodgers, Donald, son, age 9, born in North Carolina; parents born in North Carolina; attended school. Rodgers, Viveen, son, age 8, born in North Carolina; parents born in North Carolina; attended school. Rodgers, Cleo, son, age 4 years 10 months, born in North Carolina; parents born in North Carolina. Contribution from Susie Murphy Broadfoot (). 1930 census, 3rd Ward, High Point, Guilford County, North Carolina; roll T626-1695, ED 57, page 23B, line #84, dwelling #408, family #419. 1900 census, Randleman, Randleman Township, Randolph County, North Carolina; roll T623-1213, ED 95, page 6B-7A, line #98, dwelling #110, family #111. 1910 census, 1st Ward, Randleman, Randleman Township, Randolph County, North Carolina; roll T624-1128, ED 96, page 237A, line #44, dwelling #65, family #68. 1920 census, Randleman, Randolph County, North Carolina; roll T625-1318, ED 113, page 11B, line #72, family #213. 1920 census, Randleman, Randolph County, North Carolina; roll T625-1318, ED 113, page 11B, line #78, family #214.